A federal trial begins Monday for Joseph Jakubowski, who’s accused of stealing a cache of weapons and eluding authorities last spring. 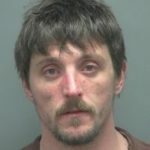 Jakubowski was arrested in Vernon County in southwest Wisconsin on April 14th, after a ten-day manhunt. He’d mailed a long manifesto to the White House, and at the time, it was feared that Jakubowski might be planning a mass shooting. Jakubowski pleaded not guilty to federal charges alleging he stole 18 guns and two silencers from Armageddon Supplies in Janesville, and for being a felon in possession of firearms.